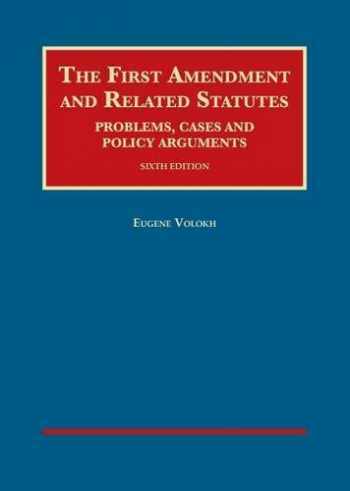 Acknowledged author Eugene Volokh wrote The First Amendment and Related Statutes: Problems, Cases and Policy Arguments (University Casebook Series) comprising 1141 pages back in 2016. Textbook and etextbook are published under ISBN 1634605101 and 9781634605106. Since then The First Amendment and Related Statutes: Problems, Cases and Policy Arguments (University Casebook Series) textbook was available to sell back to BooksRun online for the top buyback price of $74.10 or rent at the marketplace. This popular casebook examines the First Amendment using expertly-edited cases, summaries of the law, analysis of the structure of policy arguments, and problems for class discussion. The new edition features updated coverage of strict scrutiny, content-neutral restrictions, the government as subsidizer, the no endorsement principle, the no coercion principle, and religious exemptions.